Is Sterling as hated in England as it seems from the outside? From the outside looking in it looks like this guy gets an absurd amount of hate for how good he is. Something like 20 goals and 10 assists this season, and has looked lively during the world cup. Where is this hate coming from? Re: Is Sterling as hated in England as it seems from the outside? Because people are utter *bleep*, but yes it is. I literally don't get it either, also they are not helping. He clearly is struggling with confidence because he knows how much he will be criticised if he doesn't perform. Plus before Pep he struggled with confidence anyway so it's not exactly like he has the thickest skin imaginable. He frustrates people because his end product for England is not as good as it is for City. At club level he can have bad games and get less criticism for it because City have other great players who can win them games. At international level, though, Sterling is one of the most talented members in the squad so the expectation on him to perform is so much greater. It visibly effects how he performs. It's clear that Sterling doesn't relish having that degree of responsibility. He excels when he's a cog in the machine, not the machine itself. Unfortunately, the tabloids have had a large role to play in any hate. Sterling has been their go-to player for their trashy stories about his lifestyle and to some degree I think that's normalised the hate that comes his way. There're discriminatory undertones at work, because when you read his story and what he's actually like, there're literally no reasons to dislike him. You also have to factor in that playing for England leads to much harsher criticism than usual because as a nation we're an emotional mess when it comes to football. Naturally, the players that people expect the most from inspire the greater disappointment when they fail to meet those expectations. I think it's more than that Jay, I remember lots of criticism when he wanted to leave Liverpool "lots of who do you think you are" and " show some respect " people have hated him since then and the 50m move to City further heightened that hatred. So while the frustration of performances is part of it I don't believe that's where it started, he's been heavily criticised for a long time before that and this only heightens that criticism. 2 goals in 42 games and 0 in the past 3 years is a shockingly low tally for an offensive player tbh. @Great Leader Sprucenuce wrote: I think it's more than that Jay, I remember lots of criticism when he wanted to leave Liverpool "lots of who do you think you are" and " show some respect " people have hated him since then and the 50m move to City further heightened that hatred. Yeah the Liverpool loving media went into hysterical over drive when he wanted to upgrade to lowly Citeh. It just snowballed from there. At the same time there's bare 'Stop picking on Sterling coz hes blacc! !1 Fucc the DailyMail & Brexit!!' stuff to offset it. Back in the day when Becks, Rooney, Terry, Gerrard were copping it no one was caping for them and that's when the tabloids were way more powerful. 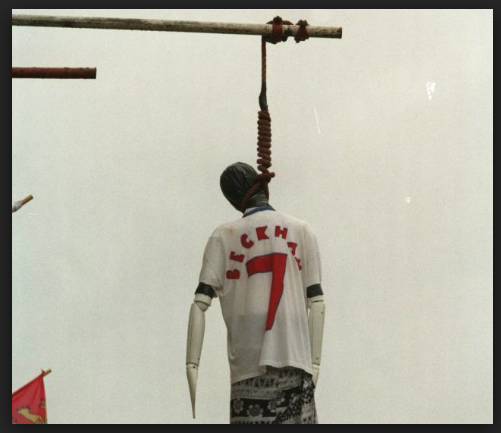 I mean, Sterling gets some serious unfair treatment from the press but if Beckham can come back from that lovely picture, Sterling definitely can. Score a match winner for England and all would be probably well.